There are some 130 food items in the proposed WPI whereas the retail price collection basket with the most items has only 46. The Planning Commission is to agree by the end of 2014 March on the composition of an expanded set of items for the wholesale price index. The expanded index – with a few new categories and some reclassifications – is a proposal, formally, by the Office of the Economic Adviser, Ministry of Commerce and Industry. 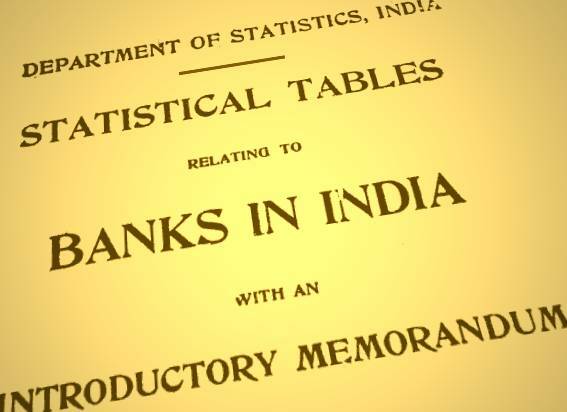 But there are retail wheels within wholesale ones, and there are indications provided by the financial and business press that it is the Prime Minister’s Office that is backing the revision – which will also allow the Reserve Bank of India to make decisions about interest rates that could benefit industry. My interest was drawn to the several additions that have been made to the category of ‘food articles’ (some of which has been covered by media reportage, which quite typically has ignored the changes proposed in the rest of the categories). More important than these few changes to the components of wholesale food price are the additions made under the ‘manufactured products – food products’ category. 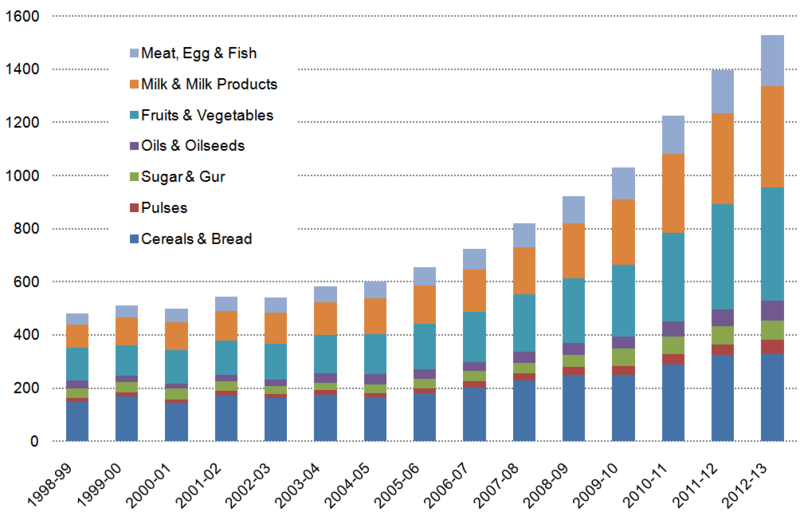 This is a greater expansion of items (although the weightages for the new items have not yet been made public) and reflects the shift in what is being purchased by households – more packaged and processed food in place of raw cereals, pulses, fruit and vegetables. The expanded list also signals the dietary shift – a nutritional time-bomb whose effects can already be seen in the rising rates of youth becoming overweight – towards processed cereals, sugary drinks, edible oils, and snack foods. The tall and narrow chart you see here shows the difference between the sets of items covered by the proposed new WPI and the current sets of items that are monitored for consumer retail prices. The three sets that do this are from: (1) the Ministry of Agriculture, Directorate of Economics and Statistics, (2) Ministry of Labour and Employment, Labour Bureau, and (3) Ministry of Consumer Affairs, Food and Public Distribution, Department of Consumer Affairs. This is the second expansion in the number of items that make up the WPI in the last three years, whereas the relatively much smaller list of items that are used to monitor the prices of food for consumers has remained the same over the same period (the last revision was about five years ago in the Ministry of CAF&PD system). 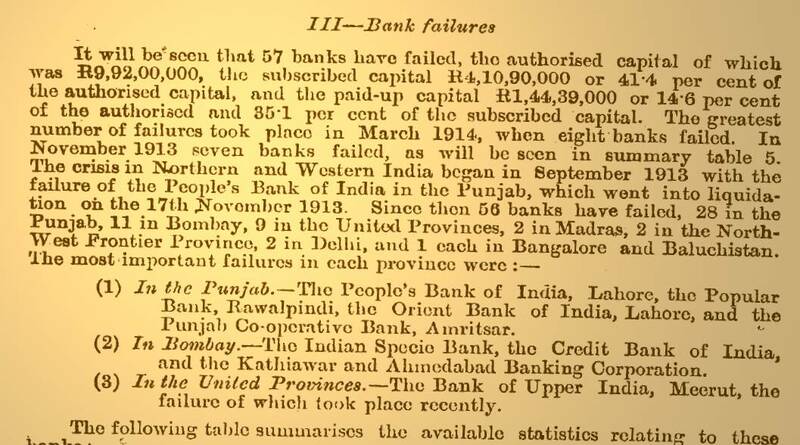 As usual, there is little or no public discussion on the additions to the WPI and the continuing neglect of the items that are used to compute the consumer price index – some of those collection systems are 30 years old. The proposed expansion of the WPI food and food-related items will deepen the already very serious lack of correspondence between the WPI and CPI. More troubling is the deepening meaninglessness of the CPI numbers – rural and urban for major states doesn’t help one bit if the list of items is not expanded to reflect more accurately what households actually buy, rather than ignore the growing list of items they do. Continuing to ignore this long overdue need for correction will short-change India’s salaried workers and wage earners, and very seriously under-report true inflation especially for food.